We pay fast cash for your car, truck, SUV, van, R.V. or motorhome. No title? No problem! Dependable same-day service anywhere in Dallas, Fort Worth, the Mid-cities and more. No hassle. No middlemen. Get paid cash today! We buy all makes and models including Ford, Toyota, Chevy, Dodge, Kia, Honda, GMC, Audi, Volkswagen, Nissan, Infiniti, Mercedes Benz, Lexus, Jeep, Hyundai and more. ​We buy all RVs and Campers, running or not. This includes 5th wheels, pop-ups, Class A - C and more. American Coach, Coachmen, Columbia Northwest, CrossRoads, Dolphin Motor Coach, Dynamax, Entegra Coach, Airstream, Winnebego and more. Who pays the most for cars in Dallas and DFW? When selling your used car in Dallas Fort Worth, common questions you might ask yourself include "Who pays the most money for my car in Dallas and DFW?" "Where is the best place to get cash for a used or broke down car, truck or SUV?" "What's a good trade in value for my used car?" We can help with any questions relating to getting rid of your new, used or junk car. With over 20 years of experience, we are the top auto buying experts in North Texas. Cities in DFW we've made recent purchases in include Addison, Allen TX, Arlington, Garland, Mesquite, Rockwall, Lewisville, Forney, Plano, Terrell, Seagoville, Crandall, Rowlett, Fort Worth, Royce City, Balch Springs, Grand Prairie, Lancaster, Richardson TX, Frisco, McKinney TX, Cedar Hill, Irving, and more. Motorhomes for cash also available. We now also pay cash for 5th wheel trailers. Inspecting your car's drive belts: The multiple belt system. Older cars have only one drive belt, driven by the crankshaft pulley and commonly called the fan belt, it turns not only the fan, but also the water pump and the generator. Today, many cars use the same basic fan belt system, yet have additional belts to drive optional accessories, such as the air conditioning compressor and the power steering pump. Performance of all belt driven components depends on the condition intention of the belts. Inspect the belts every three months. If a belt is damaged, replace it and tighten any belts that are loose. Car fact: Your car's engine rotates 1000 times each minute on average, generating a tremendous amount of heat and friction. Without lubrication the engine would soon fail - Oil moving the pump throughout the engine coats its moving parts and reduces friction. Engine oil pump throughout the engine coats its moving parts, reducing friction. As oil circulates through the engine, it picks up dirt and carbon residue. Changing the oil and oil filter frequently is one of the simplest and most useful things you can do to prolong the life of your engine. Store the waste oil for recycling and do not flush it down the sewer. Safety tip: Always allow your car's engine to cool completely before working on the fuel system, and follow all recommended safety guidelines. Gasoline vapors are extremely explosive. Be sure to wipe up fuel spills as soon as they occur, and do not smoke or cause electrical spark. If gasoline gets on your skin, wash it off immediately. Do not sprays solvents or starting fluids at a hot engine. Work in a well ventilated area and store flammable or poisonous materials properly and safely. The following tip can help with getting a used car running again - With the car engine off and the transmission in neutral, pump the brakes several times, then hold the brake pedal down. It should not move more than halfway to the floor, and should maintain pressure for at least 30 seconds. If the pedal sinks slowly to the floor, the brake system may have a leak. First check for a leak where the master cylinder joins the power booster. If you see wet spots at the fittings, tighten the nuts with a wrench. Next, wipe away wet spots and pump the brake pedal as you did before. If the wet spots reappear, have the brakes serviced. If fluid leaks from the car's master cylinder into the power booster, you will find brake fluid in the vacuum hose that leads from the booster. Pull the end of the vacuum hose off its vacuum port, take off the check valve and examine the hose's interior for fluid. If you are not able to see inside the car clearly, carefully twirl a narrow screwdriver into the hose. If the tool has fluid on it when it is withdrawn, there is a leak; havae the brakes serviced professionally to keep your car running well. To tighten the brake line fitting, raise the car on jack stands. Inspect all four wheels at the point where flexible brake line, or hose, joins the brake. An oily, damp patch indicates a leak. Wipe the area clean. Gently tighten the fitting holding the brake line to the brake using a tubing wrench or combination wrench. Now pump the car brakes a few times; if the leak reappears, have the brakes looked at or sell us your used car and avoid the hassle entirely! Tighten the bleeder valve connection. On drum brakes, the bleeder valve is on the backing plate; on disc brakes, it is on the caliper assembly. Oily patches on the drum brake's backing plate indicate a leak from either the brake line, bleeder valve or brake cylinder inside the drum. Wipe the wet spots dry, then gently tighten the bleeder valve with a tubing wrench or a combo car wrench. Wipe away wet spots and tighten the bleeder valve to make sure everything is in good working order. To adjust a parking brake nut on a car with rear disc brakes, have the parking brake adjusted by a professional. On a car with rear drum brakes, engage the parking brake halfway if possible. Raise both rear wheels using jack stands and chock the front wheels. Locate the steel cable leading from each rear wheel to the parking brake pedal. On some cars, these cables meet near the middle at the tension adjuster. To tighten the parking brake, loosen the locknut and turn the adjusting nut clockwise, using a combo wrench. We buy cars, trucks, vans, and SUVS in a wide range of conditions, years, makes, and models. At this time, we don't buy motorcycles, scooters, RVs. WHAT DO I NEED TO SELL MY CAR IN DALLAS TEXAS? In order to sell your junk cars for cash, you will require proper paperwork including the title and registration information. Once you have this information, we will help you through the remainder of the process to speed it up and get you the money you deserve. We provide a 100% satisfaction guarantee to our customers. As a thank you to our customers as well as a guarantee as to the quality of our service, we will not be satisfied until you are. It's quick and easy to get paid top dollar! 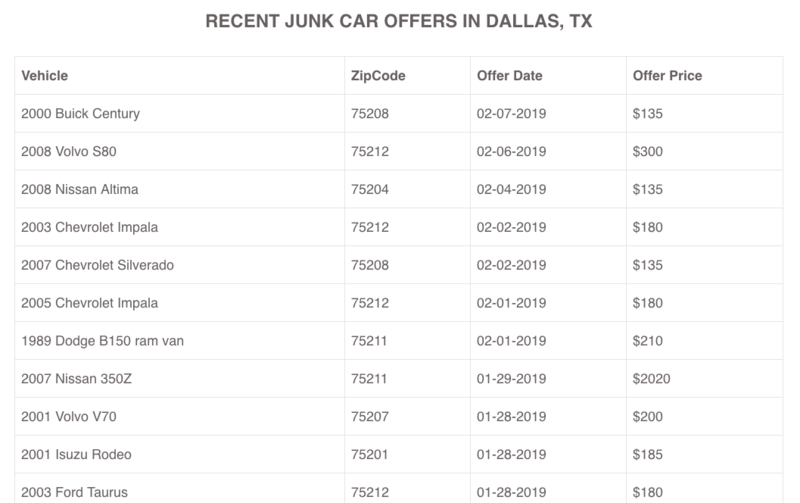 2012-2019 North Texas Auto and RV Buyers - Best Cash for Cars (new and used) in Dallas, TX. Serving DFW. Best pricing in town. Visit our junk car buyer sub-site.